Staying Connected to Who You Are - Even At Work ~ Primed for Possibilities with Felicia B. Do these approaches to your work day sound familiar? You reach into the closet for clothes that present you as your “work” self. On arrival, you do a bit of shapeshifting as you walk toward the doors to the building – from who you are at heart, to who you feel like you need to be to succeed. That might mean you are more outgoing – or less. Or that you smile more, and look like you have absolutely everything under control all the time, personally and professionally. And perhaps you routinely leave your values outside that office door, feeling they have no place – no use – for the next eight or so hours. It may feel risky to show more of who you really are at work; but think of it as self-care. Staying connected to who you are, even at work, lets you act with confidence and presence, based on your intuition. There’s a certain rightness to it, and it is empowering. Here are six ways to get started. Staying connected to who you are means you need to understand who you really are. That’s not always easy, especially if you are used to living up to the expectations of parents, teachers, and bosses. That’s OK. Give it time. Look for those sparks that tell you who you truly are – the things that bring you joy, the things you’re naturally drawn to, and – above all – what you know intuitively. Let go of “shoulds” – like being told “You should be more social!” and “You should smile more!” or “You should wear brighter colors!” There’s nothing wrong with smiling only when you feel you have something to smile about, wearing muted colors that make you feel grounded, and enjoying your own company. These things sustain you, and support you in focusing and making progress on your work. You – guided by intuition, that “gut feeling” – are the best authority on how to bring out the best in yourself. Be aware of your energy, what feeds it, and what drains it. Manage your day as much as you can to feed your energy levels. At what time of day does you energy flag? Plan a break for that time, go outside for some Vitamin D if that’s what feeds your energy, or with others if that gives you a boost. Take responsibility for your energy by avoiding those who drain you, when you can. Taking time out for renewal and being present with yourself helps you to maintain boundaries around your work, and reduce stress and overwhelm. From this place you’re able to get more done and feel more accomplished. When decisions need to be made, it’s exhausting to second-guess what management wants. Instead, ask yourself what your insight and values dictate – then advocate for that approach. When you have to defend it, you’ll be able to do so naturally, and you’ll differentiate yourself. What do you value? Balance, leadership, contribution, compassion? Bring those into your day. When you don’t incorporate your values in your work life, it’s easy to forget what’s most important to you. It’s also easy to get caught up in others’ values and take them on as your own. That misalignment creates burnout because you’re working against yourself. Remember, you are still a human being at work, and you bring with you all of your thoughts, feelings, emotions, histories, preferences – and your values. You don’t have to leave these significant parts of yourself at the door. Do you feel guilty when you aren’t busy? After all – shouldn’t you always be doing more, more, more? Some cultural norms would say so. But if you’re experiencing burnout, try setting some boundaries. Begin by saying “no” whenever you can. Instead of telling yourself you’re too busy with other things, say “yes” to things that renew and rejuvenate you – and that includes time for rest and goofing around. You may be dealing with a highly social workplace with lots of after hours functions, while you are essentially an introvert. Or your organization’s culture may be assertive, while you find conflict exhausting. The culture may be one of late nights, partying and bar food, while you support your body with healthy eating and sufficient rest. What to do? Find a balance. Forcing yourself to go along to get along and just try to fit in is a setup for burnout, because you’re spending your energy reserves trying to conform to something that doesn’t work for you. Meet others for a drink after work if and only if you feel like it. Hold yourself apart from conflict, if conflict is hard for you – you might actually get a reputation as the organizational peacemaker. Show up early at that party, nibble a bit, and excuse yourself early. In whatever way you feel you differ from the overculture, make as much room for your preferences as you do for the preferences of others. 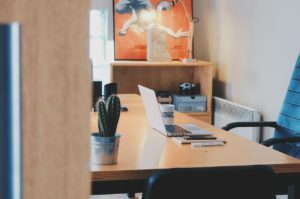 “Our environment and workspace can have a significant impact on productivity,” says author and coach Amy Jen Su. Creating something of a haven that reflects who you are can give you a refuge in which your best qualities are affirmed in the work you do. “Put up pictures, artwork, or images that inspire you or remind you of the people and things that matter,” Su suggests. “Your workspace should feel like a reflection of your best self.” On days when your workspace isn’t working for you – such as days when there’s too many visitors or too much noise – reserve a conference room and work from there for a couple of hours, or for the day. How would things change for you if you brought more – or all – of the self that’s authentically you to work each day? If that thought, and the suggestions in this article, sound risky, remember: you don’t have to make huge changes overnight. Try one or two of these approaches over the next couple of weeks. It’s all about self-care – no need to bring in that pesky editor who gives you lots of “shoulds” and deadlines! Even when you get a routine of self-care going, there will certainly be times when you need to push through to meet a deadline. But promise yourself that, if that’s not the case, you won’t neglect yourself. Taking time out for renewal and being present with yourself helps you to maintain boundaries around your work and reduce stress and overwhelm. From this place you’re able to get more done and feel more accomplished. Do these ideas and approaches resonate for you, but you have doubts about your ability to put them in place? Or perhaps you worry that, ultimately, your own values differ from your organization’s too much for you to find an acceptable balance and alignment. I understand. It can be challenging to avoid getting burned out by the values of the workplace. If I can be of help, contact me – together, we’ll work on how you can bring the important parts of yourself through that office door with you, and bring your whole self to work.